What do you do to cope when someone you loved has died or abandoned you? Your body can only hold so much emotional pain. If you continually suppress it – you will develop physical problems which can start with headaches and may eventually develop into something really scary like the big C –cancer! Dr Janet Hall’s “Heal Your Broken Heart With Hypnosis” audio has the solution for the healthiest way to let go of your upset. 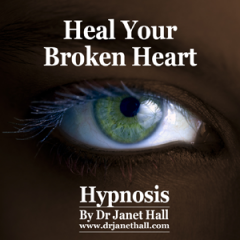 “Heal Your Broken Heart With Hypnosis” gives a unique hypnotic experience which allows your upset to be released and then energizes you to recommit to your right for maximum personal and relationship success. You’ll learn about the best, most economical, least painful and most productive way of freeing yourself of your pain and clarifying your future – using the bucket theory and the love letter process. Golden Thread Releasing Process – a tranquil and inspirational experience is evoked where you are the star player and you have the leading role in telling whoever has hurt you about your pain. This will give you immense relief in having been heard and understood, perhaps for the first time, and then in forgiving them and yourself, for your part in it all so that you can move on into a positive future.